The MXWall-LT is a video wall processor and matrix switch with 8 HDMI inputs and 8 DVI outputs. Compact, plug-and-play, and excellent for mid-sized video wall displays up to 8 screens with resolutions up to 1080p (1920x1080 @ 60Hz) Full HD. The MXWall-LT is simple to control, outfitted with easy front-panel buttons and optional RS-232 control. Included at no cost is the MXWall Manager software, which allows users manually create and adjust their ideal video wall displays using simple click-and-drag operation. Users can choose from a number of great per-configured screen modes as well, displaying content in full video wall, four-screen quad, and individual screen modes with the press of a button. 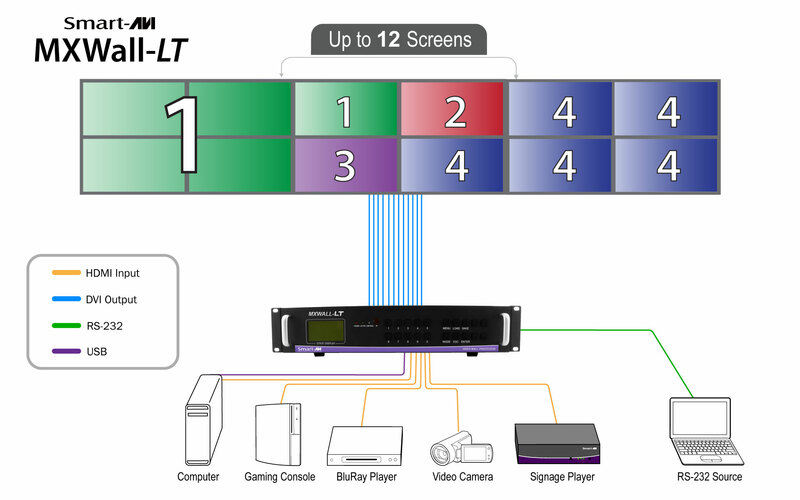 The MXWall-LT also features TCP/IP web control for LAN-connected units, so users can control the contents of the video wall from the comfort of a PC workstation. Its compact design and powerful processing power makes the MXWall-LT the perfect solution for any video wall installation. Plug-and-play, the LT is immediately ready for use as soon as it is connected to an AV set-up; no additional drivers or installers required. Please note: This diagram is for the entire MXWALL series. For 12 screens, the MXWALL-LT-1204-S is required. The MXWALL-LT-0808-S can operate up to 8 screens.